Here’s Day 2 of the St. 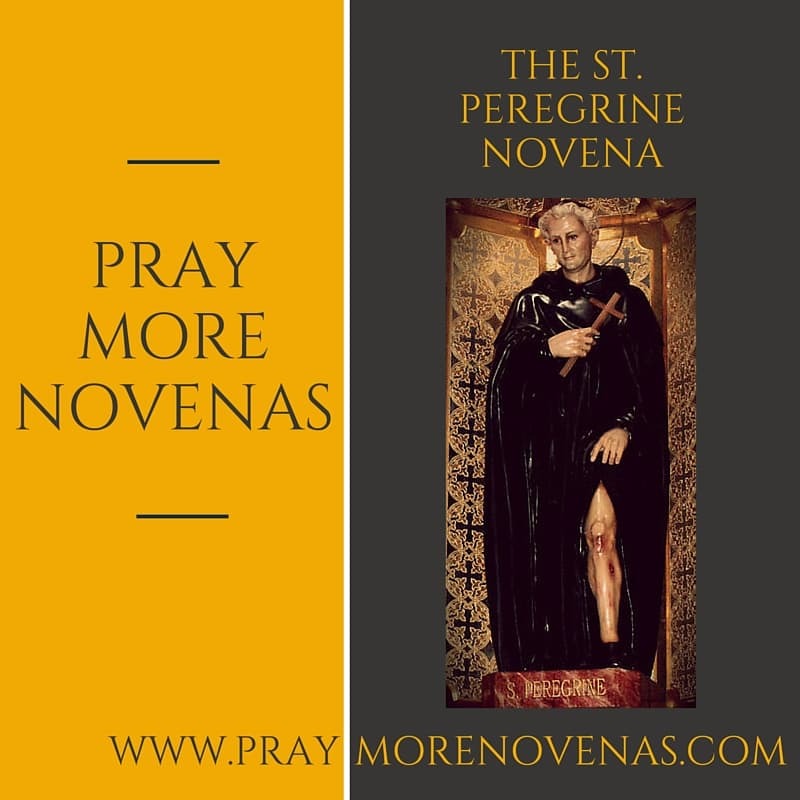 Peregrine Novena! Please Pray for complete healing for my friends, and bring each one closer to our Lord. my prayer intentions are for my husband and I to be blessed with a long life together to enjoy many years of retirement and our children and grandchildren. please keep us from any serious diseases and to be guided to the proper physicians that can help us if something with our health should come up. Lord I pray that you will give me kind words and healing hands to mend the hurt between me and my sister. Dear St. Peregrine —- I am scheduled for my mammogram on Saturday, and I am already stressing out over it. Please intercede for me and ask that my request be granted. I ask that the results are all clear and no further testing required. I pray for everyone suffering from cancer or other life-threatening/chronic diseases and that one day there might be a cure for all of them. I pray for everyone with cancer, their families, and all the Holy souls in purgatory. I also pray for the Holy Spirit to continue to guide, and fill me and my children and husband. Lead me Lord. Here is am. In your name in pray, Amen! For Kayla breach baby to be born safely. I pray for complete healing for my baby boy! Please intercede on behalf of Katie for her to be cancer free/tumor free and that her body is restored with good health soon! I am asking to include my son Ryan in this novena as he finishes his final chemotherapy treatments for Angio Sarcoma. He has had part of his thigh muscle removed already and is especially tense about the scan which follows his treatments that will show whether he is either free from cancer or has need for futher treatment. Please pray for my father, Tim Carmody as he struggles with colon cancer. All doctors have given up any hope for his survival. Please pray that the Lord can give him the strength to keep his eyes and heart set on Jesus. We are praying for a miracle if it is the Lord’s will. Thank you everyone. May God bless you. Please keep Steph free from NHL and that my husband can be helped with his memory loss. Please give me strength to get my life back. In the name of the father. Thank You. Pray for all people that are suffering and need faith and hope to feel better. Also stay relaxed for all my doctor and dental care. I pray this novena for myself, my daughter, family and all those suffering from any form of Cancer. Amen. I am praying this novena for Miss Patsy Miller in lake Charles Louisiana . She is suffering with cancer , please pray with me for her thank you . Prayers for our classmate Bonnie as she begins her chemo. Praying that she will recover from cancer and live a long and happy life. Peregrine, we pray today for healing. Thank you for taking away the cancer. St. Peregrine please pray for my family’s healing. Praying for L.L. for her remission of cancer, and Her continued good health. And for My Cancer, to continue to receive good test results.